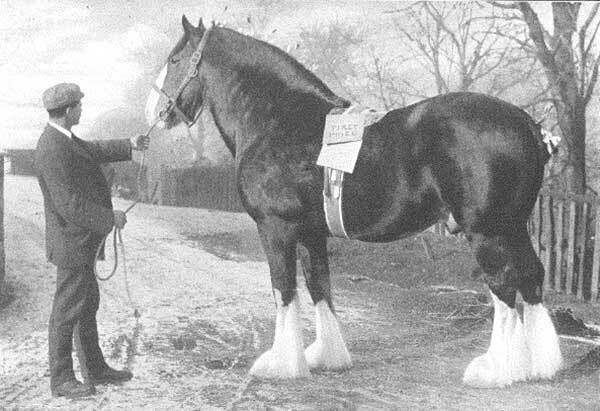 The Clydesdale is a breed of heavy draught horse indigenous to Scotland and deriving its name from the district in which it was founded. The Clydesdale's origin is accredited back to the 6th Duke of Hamilton, who in the middle of the 17th Century imported 6 Flanders stallions to Scotland and bred from them using some of the best Galloway or pack mares. John Peterson of Lochlyoch imported a black Flemish stallion to improve his breed. The Lochyoch mares were of a uniform stamp - mostly browns and blacks with white faces and a little white on their legs, grey hairs in their tails and occasionally through their bodies. They also had a characteristic white spot on their bellies. This was recognised as a mark of purity of the blood. "Glancer", also known as "Thompson's Black Horse", is to be found in the pedigree of Clydesdale's today, he was foaled in 1810 and is believed to be a direct descendant of the Lochyoch mares. The Clydesdale Horse Society of Scotland was founded in 1877. At its peak, Scotland had around 140,000 farm horses plus an unknown number in towns and cities, most of which were Clydesdales in whole or part. The top year came in 1911, when 1,617 stallions were exported. Three years later Clydesdale horses were conscripted by the army to serve in The First World War. It is known that between 1850 and 1880 a large number of the best stallions and a few good quality mares were annually exported mainly to Australia and New Zealand.